Alice Raucher, architect for the University of Virginia, on Friday updated the Board of Visitors’ Buildings and Grounds Committee on the schedule for completion of the designs and the utilities plan for the landscape and streetscape project at what has become known as the Ivy Corridor, where the University is planning major changes on the north side of Ivy Road. The area, ranging from the Cavalier Inn to the intersection of Ivy and Copeley roads and northward to the railroad tracks, covers roughly 14 acres and is owned by the University and the University Foundation. The planned improvements along the corridor are designed to make the area more pedestrian- and bicycle-friendly, with more green space for the benefit of the University and Charlottesville communities, and to improve the connections between Central and North Grounds. Still in the design stage, the plans include widening sidewalks; planting “tree lawns,” a width of grass with trees between the road and the sidewalk; installing street lamps; and providing stair access to the International Residence College from Ivy Road. The project also proposes bicycle lanes and a shared-use path through the railroad trestle and north along Emmet Street. 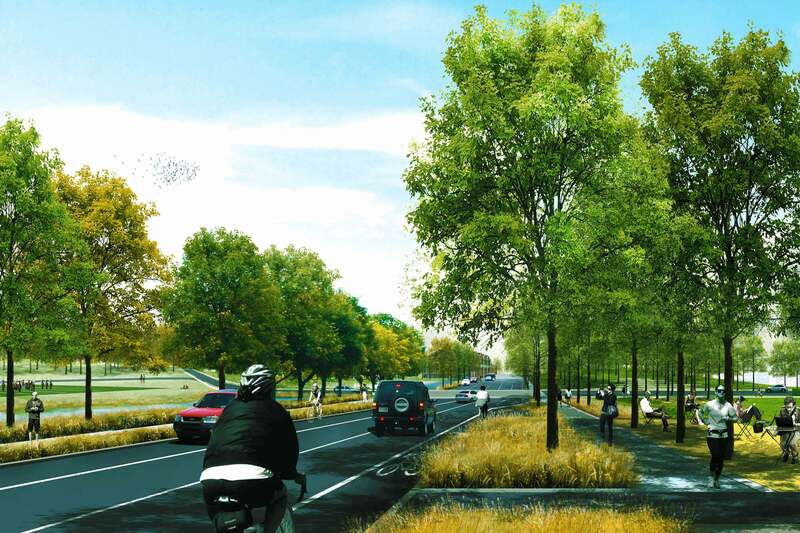 Ivy Road will be more tree-lined in the planned redesign of the University’s western entrance corridor being considered by the University of Virginia and the City of Charlottesville. The area also contains a central green space, a working landscape functioning as a stormwater management area, as well as plans to place utilities underground. The Board of Visitors is seeking to enhance the connectivity of the area to the rest of the University and for the Charlottesville community while maximizing green space; accommodating existing transportation, parking and stormwater management needs; providing appropriate screening of the Ivy-Emmet Parking Garage; and developing the site to its maximum potential by promoting viable development and University support activities. The University is collaborating with the City of Charlottesville on a plan, funded by $12.1 million in state transportation funds, to improve pedestrian and bicycle connections and safety; consolidate bus stop locations; construct a new shared-use path through the railroad trestle; and improve traffic and pedestrian flow from Arlington Boulevard to the Ivy/Emmet intersection. Phase I, which concentrates on the streetscape along Ivy Road and Emmet Street and the green space on the site, recommends demolition of the Cavalier Inn, which is slated to close in May 2018 after Finals Weekend. The UVA Foundation is working with the inn employees to assist them in identifying other employment opportunities. Foundation staff has also been in discussions with the owners of The Villa restaurant about possible relocation. The Cavalier Inn will be replaced with more open green space in the proposed redesign of the north side of Ivy Road. The plan also calls for taking down a small former service station north of the Cavalier Inn and a brick house to its west. The house, which currently contains University offices, has no significant historical value. The former service station has most recently supported UVA Intramural and Recreation Sports’ outdoors program. The intersection of Emmet Street, Ivy Road and University Avenue will be modified for safer pedestrian crossing, bicycle lanes and more efficient traffic passage. Under the proposed design, the wider sidewalks will have green buffers to separate them from the vehicle traffic lanes. The plan promotes greater utilization of the existing 1,200-space Ivy-Emmet parking garage, which is not being used to capacity now, and the elimination of current surface parking spots. The Office of the Architect, the UVA Foundation and Facilities Management have been working on this project with DumontJanks of Boston, designers and prime consultants; Vanasse Hangen Brustlin Inc. of Richmond, the traffic engineering consultant; Biohabitats of Baltimore, the stormwater and environmental consultant; and the City of Charlottesville.